Talking Point: Is Monaco safe to race on? THIS weekend sees the hosting of the ultimate jewel in the crown of Formula One, the Monaco Grand Prix. The late team boss Enzo Ferrari once said that ‘winning Monaco is worth half a championship.’ It isn’t quite like that but after the unpredictable start to 2012, with five different winners in the first five races, Monaco could turn out to be a pivotal event when it comes to momentum for the rest of the championship. Many of the greats have won around here. The late Ayrton Senna won six times between 1987-1993 and was almost unbeatable at his peak. 2001 might have been his last success in the principality but Michael Schumacher didn’t win Monaco by accident on five separate occasions. Graham Hill is another five time winner and the ‘Professor,’ Alain Prost triumphed four times. Out of the current crop, Fernando Alonso, Schumacher, Kimi Raikkonen, Mark Webber, Jenson Button, Sebastian Vettel and Lewis Hamilton have all won around the principality. However with the radical advances in modern day technology, especially in the car industry – have the streets of Monaco outgrown Formula One and is it time to stop racing there for good? Last season’s race weekend had some lucky and frightening shunts that brought the safety around Monaco argument up into the mould again. Nico Rosberg was incredibly fortunate to escape a nasty connection with the barriers on Saturday morning last year when he crashed his Mercedes on the approach to the Nouvelle chicane. In qualifying, Sergio Perez wasn’t so lucky and missed the race following an even worse shunt at the same corner. Perez was concussed, bruised and admitted later on that it took him at least three races to get over the accident psychologically. In the race, a multiple accident triggered by Adrian Sutil clattering the wall at Tabac saw Vitaly Petrov hospitalised with bruising on his ankles and caused the race to be suspended. It was the busiest weekend for the F1 medical team since the 2001 Australian Grand Prix. The officials have listened and made some safety changes for the 2012 event. The barriers where Perez crashed last season have been moved back in the hope of restricting a sudden impact should a car lose control at the fastest part of the track. Like in 2011, the use of DRS has been banned from use in the tunnel and more of the corners will have the impact-absorbing barriers that no doubt saved Perez from even more serious injury. The tunnel area has come in for criticism as a hotspot for potential serious shunts. Karl Wendlinger crashed in 1994 and fell into a deep coma from his injuries. Jenson Button was concussed and missed the 2003 event following a similar shunt in practice and Alexander Wurz escaped without injury after a huge smash in the 1998 race. However the only fatality at the Monaco Grand Prix has been Ferrari’s Lorenzo Bandini, way back in 1967. The Monaco Grand Prix is the most prestigious event on the calendar and still king of the street circuits, despite the glamour of night racing in Singapore. If you’d say Monaco is dangerous, what about faster tracks with average speed like Spa, Suzuka and Monza? Fingers crossed that the weekend goes through peacefully without any serious accidents but the risk has always been there. It isn’t a deathtrap and as far as I’m concerned, if the race in Monte Carlo disappeared ever – there wouldn’t be much point of holding a Formula One World Championship. 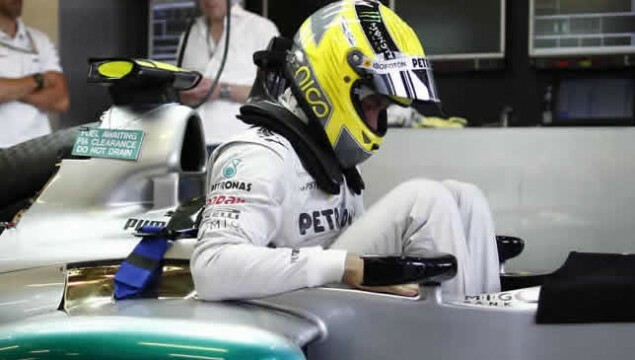 Talking Point: Should Schumacher stay on? THE elder statesman in Formula One, one of the greatest ever is going through another barren period in his failed comeback. If some say Kenny Dalglish’s second return to the Liverpool FC dugout was unsuccessful, as he was sacked this week, what does this say about Michael Schumacher’s return. Statistics can sometimes make viewpoints ridiculous but these facts don’t lie. Two and a half years into his return and it reads; no wins, no pole positions, only twice in the top three in qualifying, no podiums and a series of desperate crashes which indicate that reactions are getting slower and speed is being lost. True, form is temporary and class is permanent but Schumacher has shown evidently little in his return and after five races in 2012, he sits a dismal 18th in the championship, with three non-finishes and just two points to show for his efforts. This is Schumacher’s worst start to a Formula One season and there will be those in the paddock will be questioning his motivation to continue. The second Michael Schumacher certainly is a lot more relaxed than the first version and there can be no doubt that there is some enjoyment in him competing. However he isn’t delivering the results expected and no excuses about the car in 2012 should be allowed. 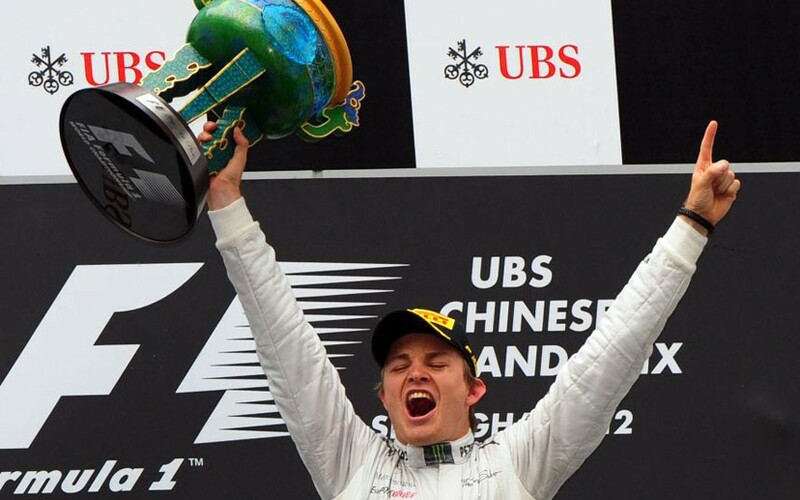 The Mercedes was the class of the field in China, as shown by new race winner Nico Rosberg. The team probably aren’t getting the full potential out of the chassis at the moment but whereas Rosberg has finished fifth and seventh in the last two events, Michael has only managed a fortunate tenth and another DNF in Barcelona last weekend. In their previous two years at Mercedes together, it was notable that Rosberg had been comprehensively outperformed by Schumacher at the Circuit de Catalunya, with Michael achieving fourth and sixth place finishes in that time. The tables were turned last week and his performance was simply forgettable. He only just scraped into Q3, lagged behind Rosberg on raceday and then had a clumsy accident with Bruno Senna which ended his race after just 13 laps. The incident occured entering turn one, as the Mercedes had a great run on the Brazilian’s tyre-hungry Williams. At the braking zone, Senna moved but only slightly to the inside to protect his line. Despite having not pitted, this was a battle for position. Schumacher completely misjudged his braking point and smashed into him. It was an error you’d expect to see a rookie driver make, not a seven-time world champion. A five place grid penalty for Monaco next weekend is deserved and with Monte Carlo being so difficult to overtake on, his chances can’t be that good to improve on his points score. What made me laugh even more was the way he called Senna an ‘idiot,’ over the radio. Those with small memories should remember Adelaide, Jerez, Hungary 2010 when he tried to put ex-team-mate Rubens Barrichello in the pitwall. You have to admit your mistakes or you don’t improve as a driver and these are testing times for the German, who might have produced some masterstrokes in the Ferrari days but is only tainting his own reputation and status as one of the greats. While panic stations shouldn’t be alerted now and others like Felipe Massa could be only one race away from the sack, attention must turn to 2013 and what the Mercedes GP board do. Schumacher’s contract expires at the end of the season and I think he has an intention to carry on. Ross Brawn wasn’t present in Barcelona but he won’t want more performances like this from an experienced head. Ross has got a tough decision to make, especially considering the success the pair have had at Benetton and Ferrari together. Loyalty is a big commodity to have but how far can you go? Rosberg has a long-term deal, is now a race winner and looks extremely settled and Mercedes will want a second driver who can deliver the goods on a regular basis. I’m afraid Schumacher isn’t ticking this box at the moment. Who should Mercedes go for then? Lewis Hamilton is believed to be stalling on a new deal at McLaren, works closely with Mercedes anyways and has a great relationship with Rosberg. There’s Paul di Resta who is producing consistent performances again at Force India and is groomed by Mercedes through his successful DTM days. Although he has struggled initially in 2012, Nico Hulkenberg is German and would fit well into the marketplace, plus he has talent. Jaime Alguersuari is Pirelli test driver and would bring lots of tyre knowledge to the team for next season and although there are grave uncertainties about his full fitness, a Rosberg/Robert Kubica partnership would be dynamic, considering the Pole is out of contract now following his injuries in the past couple of seasons. There are options and Schumacher’s future looks like being an integral part of the 2013 drivers market. I hope we see more of the best from Michael Schumacher and there have been gradual improvements, particularly in qualifying performance but there are too many troughs and issues to iron out. He might love his racing for sure but I don’t think that is going to be enough to keep him in a drive with Mercedes GP next season, unless he starts scoring points regularly and matches what Rosberg can do. It is time for Michael to step up and answer those doubters and Monaco is the perfect place to begin a fightback in his fortunes, both in the short and long term. REFLECTING on Nico Rosberg’s crazy and unecessary swerves on his rivals in Bahrain, I wanted to share my opinion on the state of defensive driving in Formula One and how lucky there hasn’t been any serious accidents because of this for a while. There was a time in Grand Prix racing where turning into your rival early or deliberate attempts to take a competitor out of the race seemed to be okay. Ask Michael Schumacher, who did it at Jerez in the 1997 title decider and received a very leninent penalty for the crime. Then we had the debate about weaving excessively to keep track position in defence. Damon Hill did this in Canada 1998, which upset Schumacher greatly afterwards. The boundaries continue to be pushed in the element to be totally successful. Driving etiquette in Formula One needs to be looked at because the standards in defending a position seem to be getting worse. Any driver doesn’t want to get into a position like Jarno Trulli used to; ‘There’s a green arrow, pass me on the inside.’ However, today’s drivers need to respect their competitors more and know when track position is gone. 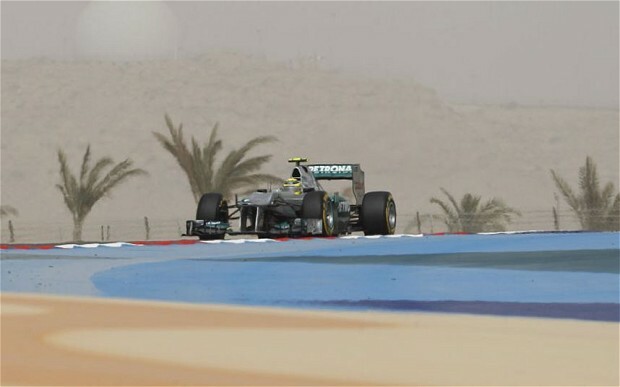 Rosberg’s moves on Lewis Hamilton and Fernando Alonso in Sakhir were dangerous and he didn’t get penalised. Luckily no contact was made in either incident but they were lucky escapes. In the first incident with Hamilton on lap 10, Rosberg dived inside the McLaren as Hamilton was exiting the pits from his first pitstop. As Hamilton got into the slipstream, the Mercedes driver went to defend the inside and started to move across the road. As the Brit dived out from underneath the rear wing, Rosberg squeezed him completely off the track. Lewis had to take to the concrete asphalt to avoid Rosberg’s late direction movement and actually got infront. He might have exceeded track limits but it was either that or have an accident. I would have given Rosberg the benefit of the doubt, maybe give him a reprimand for this as he isn’t a regular offender in Formula One. The second moment with Alonso was even more dangerous, as the Spaniard had to get out of the throttle to avoid being launched over the Mercedes car. The extra speed used thanks probably to some KERS use from the Spaniard looked frightening. Rosberg continued to move from the traditional racing line and although his direction change wasn’t quite as brutal as it was with Hamilton, he didn’t give Alonso an option and sensibly, the double champion took a safe choice and backed out of the attempted overtake on lap 25. On this occasion, I would have added some time onto Rosberg’s finishing position, maybe 5-10 seconds as there seemed to be more of a thoughtful decision in what he was doing rather than a sudden movement or rush of blood. It was risky and very severe, uncalled for actually. No-one wants a repeat of Mark Webber’s terriyfing accident in Valencia 2010. The race stewards in Bahrain had their chance to send out a message of no nonsense and this they failed to do. Rosberg’s manoevures were not the worst ever seen in Grand Prix racing but it deserved a time penalty even if that just dropped him behind the two drivers affected in the final classifcation. He could count himself lucky to have not been sanctioned for the incidents. On his team radio during the race, Alonso said; “He pushed me off the track. You have to leave a space, all the time you have to leave a space.” Later that evening, he posted on his Twitter page when finding out Rosberg would not be punished,“I think you are going to have fun in future races! You can defend position as you want and you can overtake outside the track! Enjoy! ;)))” It is very true but I find his reaction to this hilarious. Pot, kettle, black spring to mind Fernando. Weren’t you the driver who squeezed Sebastian Vettel onto the grass during the Italian Grand Prix last season? Vettel criticised the move and rightly so, he was brave to make it stick too. Sounds like Rosberg was guilty then but no action was taken. The defending ruling changed at the start of the season where a competitor will be penalised if they moved across the road more than once in an overtaking scenario. 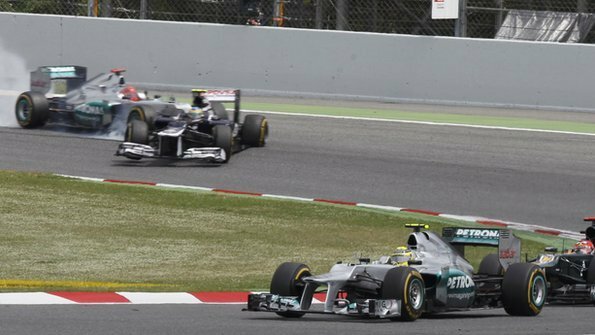 This ruling was brought in after the feisty scrap between Schumacher and Hamilton at Monza last year. Is it a ruling or just a guiding? After last Sunday’s incidents, you can’t help but agree to some form with Fernando Alonso. The decision was made and at the end of the day, all the drivers have pushed the regulations of driving etiquette to the brink on occasion. Schumacher has done it all throughout his career, Mark Webber and Lewis Hamilton have both made questionable track movements in the past in an attempt to defend their position and even the world champion isn’t perfect. Vettel has shown his ruthlessness at times. Remember giving Jenson Button minimal space at the start of the Japanese Grand Prix last season. These examples show I’m not singling out Nico Rosberg but I reckon that a precedent has to be set, starting from the annual drivers meeting before practice for the Spanish Grand Prix on May 11. I worry that in the top line of motorsport, we have got to a point where the standard of defensive driving is getting to a very dangerous stage. Make it hard and competitive of course but fair and responsible too. FORMULA ONE crowned a new winner today as Nico Rosberg joined the elite of winning a Grand Prix. He won the Chinese Grand Prix from Jenson Button by over 20 seconds to become the first new winner since Mark Webber triumphed at the Nurburgring in 2009. Not only that, the result sees the first triumph for Mercedes GP since their return as a full manufacturer two years ago. The last time a Silver Arrow was first past the chequered flag came at Monza in 1955, when Juan Manuel Fangio took the honours. Rosberg’s drive was through a combination of managing his tyres in another classic on the Shanghai International Circuit and steady pace throughout the 56 laps. Another third place for Lewis Hamilton saw the Brit claim leadership in the drivers championship for the first time in nearly two years. Although there was no sign of rain spicing up the action, cooler track temperatures played right into the hands of the Mercedes team who have struggled with significant amounts of rear tyre wear on raceday in the past. Rosberg made no mistakes from his maiden pole position yesterday and made the perfect start. He left the rest trailing into the first corner, with team-mate Michael Schumacher keeping the chasing pack behind. This enabled Rosberg to build an early three second cushion and let the German, starting his 110th race this weekend into an early rhythm. Further back, Button gained two positions and Kamui Kobayashi dropped from his fantastic third on the grid into seventh by the end of the first lap. There was minor contact between Bruno Senna and Felipe Massa whilst world champion Sebastian Vettel had a nightmare first lap and looked completely out of contention in 15th place during the early laps. Mark Webber’s decision to pit as early as lap seven to get rid of the graining soft tyres inspired his race and gave the event added dynamic. Drivers like Button and Hamilton pitted soon afterwards, indicating that McLaren were planning on making three tyre stops. Other teams such as Mercedes GP and Sauber went on a two stop strategy. There would be no benefit for Schumacher though, as he made his second early departure from three races in 2012. The seven-times world champion made a scheduled pitstop on lap 12, but a problem on the right front wheel meant a brief delay. The nut wasn’t tightened before the green light was given for Michael to leave the pits. He felt the problem into turn three on his return to the track and wisely pulled off the road. Mercedes would be fined for the unsafe release after the race. Schumacher told Lee McKenzie from BBC Sport; “I noticed it in Turn 3 once I started to load the front right tyre. Already by Turn 6 there was quite a bit of smoke and damage and I thought it was better to stop.” He would be the only retirement from a dramatic afternoon. It started as a slow burner, but the Chinese Grand Prix was about to come alive from half-distance as cars on different strategies scrambled for track position. Those planning to make the extra pitstops were rejoining in traffic all the time. Both Hamilton and Button lost crucial time in the traffic; Hamilton enjoying a brief scrap with his old adversary Massa before making a clean pass. Button’s strategy meant he had a brief stint in the lead. However he never got the gap higher than the nine second mark and any lingering hope of catching Rosberg disappeared when an issue with the wheel gun on the right rear tyre led to a lengthy nine second stop during his final pit visit. It dropped Button into the traffic and left him fighting for second. Kimi Raikkonen was part of the scrap, as the Finn planned on only making two pitstop visits. It didn’t work out as his tyres simply ‘fell off the cliff’ with nine laps remaining. In one lap he was swamped by the pack and was relegated from second to tenth. Eventually Raikkonen finished a distant 14th. The two stop strategy plan didn’t work for the Sauber drivers or Massa but it did for the two Williams cars. Bruno Senna finished an excellent seventh and Pastor Maldonado achieved his best ever result in Formula One with eighth. This included the best dice of the race with Romain Grosjean. Both survived the wheel-to-wheel entertainment and it was the Frenchman who prevailed, taking sixth place at the chequered flag for his first ever points in F1. Following Raikkonen’s drop down the field, Vettel held a surprising second place. World champions aren’t immune to tyre trouble though and just like last year, Sebastian couldn’t hold on against the more tyre friendly McLaren drivers. On the penultimate lap, Webber got past around the outside to take a satisifying fourth place. Behind Vettel, Grosjean, Senna and Maldonado was Fernando Alonso. Despite racing Hamilton closely during the event, the double world champion struggled passing the two stoppers with his equipment and had to settle for ninth place. After their Malaysian success, Ferrari have been brought back to reality. Kobayashi set the fastest lap and took the final point ahead of Malaysian hero Sergio Perez, Paul di Resta and Massa. At long last Nico Rosberg has managed to fulfil his longstanding promise. Sometimes in sport, good things do come to those who wait. Next up is the Bahrain Grand Prix in seven short days time where hopefully the action on track in Sakhir will take the headlines rather than the off-track events in the country. FOR the first time since the 1955 Italian Grand Prix, Mercedes GP have locked out the front row of the grid. That day at Monza, it was the legendary Juan Manuel Fangio and Sir Stirling Moss who led the field. Tomorrow the Silver Arrows will be driven by Nico Rosberg and Michael Schumacher. In a breathtaking hour of action, Kamui Kobayashi completes a very surprising top three on the grid as some of the favourites struggled in cool track temperatures. Rosberg had struggled to get the job done in qualifying so far in 2012, but was meteoric today. An early lap in Q3 of 1.35.121 looked like it was not going to be beaten by anyone else. No-one came close. Lewis Hamilton was closest challenger but a five place grid penalty for a planned gearbox change today has damaged his chances of winning tomorrow. Michael Schumacher inherits second place to complete the Mercedes GP front row. It is the first time that a Red Bull or McLaren driver hasn’t taken pole position since Fernando Alonso for Ferrari in the 2010 Singapore Grand Prix. Speaking of Alonso, it was another tough day for Ferrari and five main updates on their car don’t seem to have moved the Scuderia forward. Alonso edged into Q3 and achieved the maximum possible which was ninth place. The current championship leader will be praying for rain tomorrow to stand any chance of staying with the frontrunners. Felipe Massa scrambled to 12th spot, but the issues with the car are clear to see for anyone. Kobayashi had looked strong in free practice and kept his form into qualifying, always looking on the limit. Third is the best for a Japanese driver since the days of Takuma Sato at BAR Honda. Kimi Raikkonen came from nowhere to record the fourth fastest time for Lotus and team-mate Romain Grosjean made Q3 again but didn’t set a time and starts tenth. It was a lacklustre day for Jenson Button. The 2010 winner at the Shanghai International Circuit looks to be struggling all weekend with a lack of grip from the front tyres. Nevertheless he seemed satisfied with fifth place, directly ahead of Hamilton on the grid. Red Bull Racing had another difficult day and there were no smiles from world champion Sebastian Vettel. Vettel missed out on a pole position shootout in dry weather conditions for the first time since the 2008 Hungarian Grand Prix for Toro Rosso! He starts 11th as a radical set-up backfired against his team-mate Mark Webber. Webber managed to take sixth place on the grid. The top ten was completed by Sergio Perez in the second Sauber. The Mexican seemed to be on a similar strategy to his rival from Malaysia, Alonso. 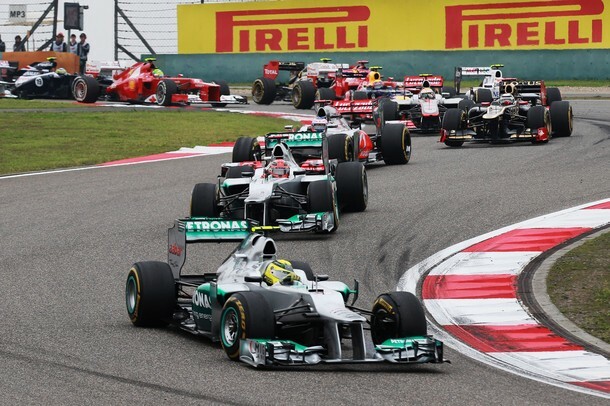 On a big sporting weekend, the Chinese Grand Prix has all the making to be another nail-biter. Today though, Nico Rosberg was the fastest across the line and it will be interesting to see whether Mercedes GP have the endurance missing from the first two events. 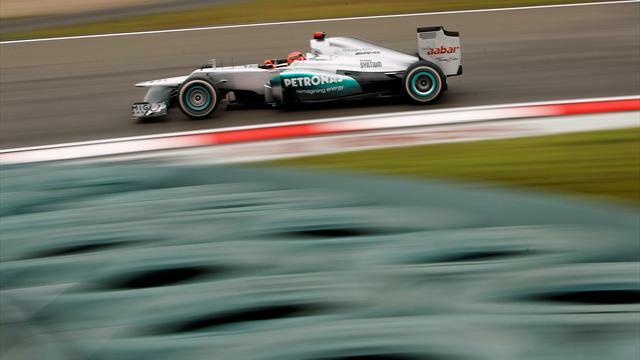 MICHAEL Schumacher went quickest in the second practice session on a quiet opening day for track action in China. The German followed up a second fastest slot in the first session which was led by Lewis Hamilton. It was a day where racing on the Shanghai International Circuit was at a premium, as matters off the track dominated the headlines. This was because the FIA released a statement in the early hours of the morning to confirm the Bahrain Grand Prix will go ahead as scheduled next week (see later story tonight for further details). The first session was punctuated by mixed conditions, with smog and drizzle meaning there was a lack of clear indication in who looks the fastest pacesetters in China. Only in the last ten minutes did meaningful times get set; Hamilton leading the way ahead of Nico Rosberg, Schumacher and the star of Malaysia, Sergio Perez. Hamilton’s fastest lap was a full second quicker than anyone else but he does carry a grid penalty for changing a gearbox between Malaysia and this weekend. McLaren managing director Martin Whitmarsh confirmed to BBC Radio 5 Live this morning that Lewis was using the cracked gearbox today and the change will happen overnight. Test drivers Jules Bianchi, Valeri Bottas and Giedo Van der Garde got minor running in for their teams as Paul di Resta, Bruno Senna and Heikki Kovalainen sat out FP1 respectively. A dry second session promoted more decisive running. The cooler track conditions mean that it will be a gamble to guess how the Pirelli tyres will handle in what is likely to be a warmer race circuit come Sunday afternoon. There was more action in FP2, as drivers attempted to make up for the lack of running in FP1. di Resta spun on the pit straight and Timo Glock had a late off into the barriers at the first corner, minus his Marussia Cosworth’s nosecone. 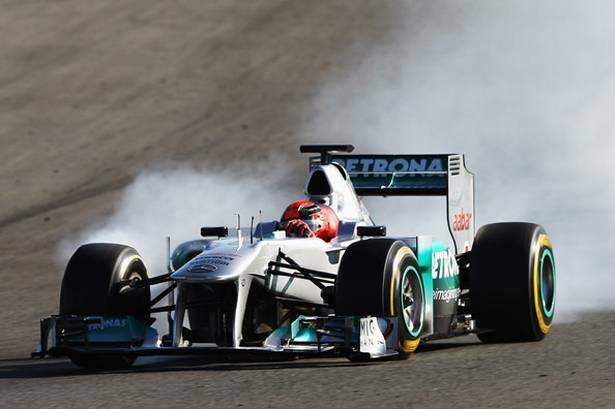 A late effort from Schumacher was enough to deny Hamilton a clean sweep of the fastest times. World champion Sebastian Vettel was an encouraging third and Mark Webber backed up a radical Red Bull improvement with fourth. Championship leader Fernando Alonso had a quiet day and was a meagre tenth fastest in FP2, as Ferrari were brought back to reality after their shock Sepang success. Lotus also had a bad day, Kimi Raikkonen propped up the timesheets in FP1 after technical problems intervened. On a day when politics ruled the sport again, Mercedes and McLaren again looked fast out of the blocks but little has been given away ahead of qualifying tomorrow morning at 7am UK time. As they didn’t qualify, I will not be rating the Hispania drivers this weekend. On the first weekend back, plenty of excellent performances, some will be frustrated will how it went and others will seriously need to raise their game very quickly, starting in Malaysia this weekend. JENSON Button made the dream start to the 2012 FIA Formula One World Championship this morning. The Brit took his third Australian Grand Prix victory in Melbourne, leading from the start in a dramatic season opener. The 32-year old Brit started on the front row of the grid, but took full advantage of a wheelspinning start from team-mate Lewis Hamilton to lead into turn one and control proceedings in Albert Park from there. World champion Sebastian Vettel used a Safety Car period to leap into a fortunate second place, ahead of a rueful Hamilton, who looked disappointed with his final result of third. Hamilton may have started on pole position, but conceded his Saturday advantage in an instant when he made a poor start. Button drew alongside his team-mate and even shifted into second gear earlier than he should have, which nearly threw away his early advantage. Michael Schumacher made an excellent start to move into third place, whilst Nico Rosberg charged into fourth from seventh on the grid as Romain Grosjean lost early positions in his Lotus. Further back, another slow start from Mark Webber triggered the traditional chaos into Albert Park’s tight first corner. Both Toro Rosso’s were involved in the meleee, with Daniel Ricciardo launching Bruno Senna’s Williams into the air. Both pitted for damage repairs at the end of the first lap. Meanwhile, a knock from Webber ended Nico Hulkenberg’s return to F1 before the lap was out. The order was Button, Hamilton, Schumacher, Rosberg, Vettel and Grosjean. Grosjean’s race didn’t last much longer as contact with Pastor Maldonado on the second lap put the Frenchman into early retirement. Grosjean blamed his rival for the incident, telling Sky Sports F1; “I think Maldonado wanted to overtake me and braked miles too late and I couldn’t give more room. He hit my front wheel so it’s very disappointing.” Actually, the Williams driver was passed and it was only glancing contact that terminally broke the Lotus front suspension. Ultimately, a racing incident but nothing else that Maldonado could have done. Moments before, Vettel pulled off an outstanding pass on Rosberg to inherit fourth and chase after the sister Mercedes of Schumacher. A double pitstop from McLaren on lap 36 looked set to have cemented the team’s 1-2 position, but Vitaly Petrov stopped his Caterham on the start-finish straight seconds later. With the Russian’s car in an tricky position, the Safety Car made its first apperance this season. Crucially, Vettel headed for the pits and didn’t have to slow down under the SC delta time given to all the drivers. Hamilton did and this enabled the champion to move into a dangerous second place, much to Hamilton’s frustration. At the restart, Button caught the rest napping and opened up a three second lead which never looked troubled as the race entered its closing stages. Attention soon focused on the battles behind and a dramatic final lap. Chasing down a struggling Alonso, Pastor Maldonado had driven a sensational race and was on course for sixth place, which would have been his best ever result. On the final lap, the Venezuelan exited turn six and dropped a wheel on the astroturf. The lack of grip from his worn tyres meant he had no time to react and the result was a smashed Williams into the barriers. It was a sorry end to a stunning performance. Yards later, Sergio Perez and Rosberg touched in the fast turn 11 chicane. Both cars were hobbled and it allowed for some furious scrapping and a frantic finish for the final points positions. Ultimately, it was Daniel Ricciardo who benefited the most – vaulting up from 12th to 9th on the final tour. 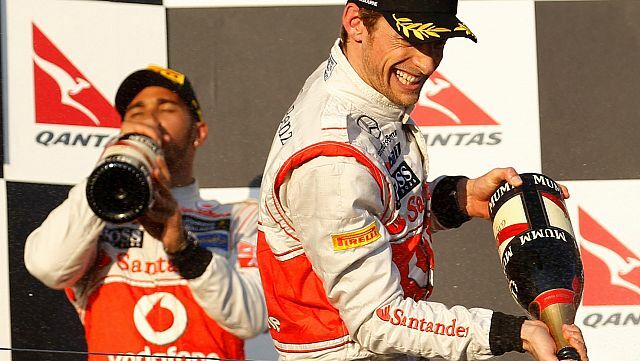 On the team radio, Button said; “Fantastic, what a brilliant way to start the season. You know, it shows what the winter does. The car is beautiful and the car is the quickest.” He is confident and on top of the world, both in morale and the early points leaderboard. It was a superb opener and we only have to wait seven days for hopefully more of the same in Malaysia. THIS season, German car manufacturer Mercedes GP begin their third season in Formula One, since they bought the Brawn GP team at the end of 2009. 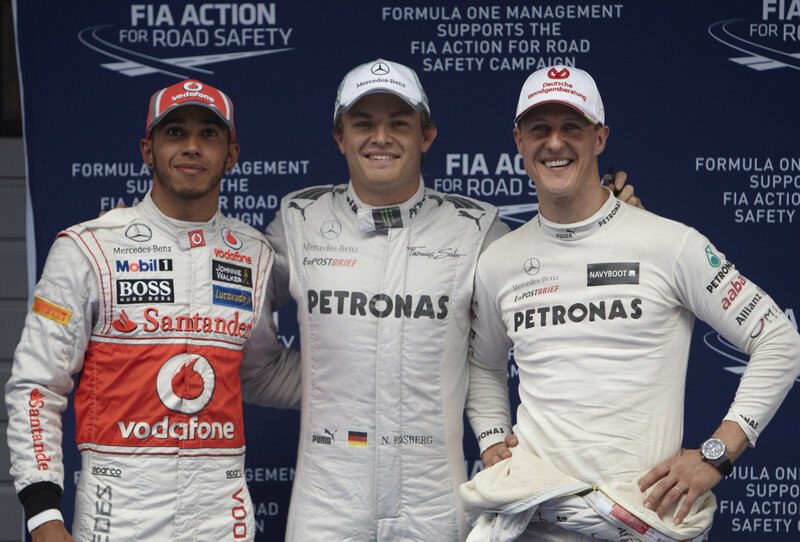 Currently, no pole positions, no wins and only three podiums to show for their efforts, with the last rostrum coming from Nico Rosberg at the 2010 British Grand Prix. It is time for the team to start threatening the frontrunners, or there could be severe drawbacks from the board in Stuttgart. In this generation of economic uncertainty, performance in Formula One is crucial or a manufacturer will walkaway. Just ask Honda, BMW and Toyota. This year, Ross Brawn’s team look to be in a far better position than they ever have been. They delayed the launch of the 2012 car, which seemed a surprising move. However when the car turned up in Barcelona, they collected some excellent data with a model that looks consistent and reliable at worst. It looks like the issues that made heavy rear tyre wear a chronic issue last season have been dealt with. It is some team that Brawn now has, full of experience in technical and winning teams from the past. Nick Fry and Andrew Shovlin remain members of the team when Brawn GP was in existance, whilst Mark Slade was part of the Ferrari team behind Kimi Raikkonen’s 2007 championship success. Former Williams and Red Bull technical director Geoff Willis returns to the team he worked for in a former guise as BAR. Willis comes from two wasted years at Hispania. Bob Bell and Aldo Costa, formerly of Renault and Ferrari respectively complete a technical dream team. The drivers remain unchanged, with Nico Rosberg and Michael Schumacher remaining together for the third sucessive season. Rosberg has performed exceptionally well, considering the equipment he has had at his disposal in the past two seasons. Often best of the rest in 2011, Nico is about to enter his seventh season in F1, hoping to break his elusive duck and win a Grand Prix. Since his sensational comeback, Schumacher has largely failed to deliver, especially in qualifying. However, he began to become a stronger match for Rosberg in the closing stages of last season, still with the racecraft, starts and strategy that made him such a legend. Form is temporary but class is permanent and Canada last year was an example that Schumacher still has that in abundance. After all, you don’t win seven world championships by accident. Mercedes GP look like the dark horses in 2012. Few know their true pace heading to Melbourne, but they must be in a position to challenge for podiums on a regular basis and if possible, return to the winners circle after a lengthy drought. The glory days of Brawn in 2009 seem like a century ago.